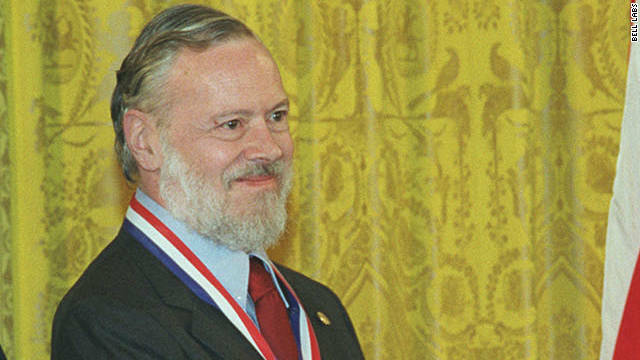 Dennis Ritchie received the National Medal of Technology in 1998. With the world still reeling from Steve Jobs' passing, yesterday brought computer users and programmers more sad news. Dennis Ritchie died Wednesday at age 70. Ritchie, together with Ken Thompson, co-invented Unix and created the C programming language at Bell Labs. They won the National Medal of Technology for their contributions. While the introduction of Intel's 4004 microprocessor in 1971 is widely regarded as a key moment in modern computing, the contemporaneous birth of the C programming language is less well known. Yet the creation of C has as much claim, if not more, to be the true seminal moment of IT as we know it; it sits at the heart of programming — and in the hearts of programmers — as the quintessential expression of coding elegance, power, simplicity and portability. Someone essentially lend a hand to make critically posts I would state. This is the very first time I frequented your website page and up to now? I surprised with the analysis you made to create this actual put up amazing. Wonderful process! Without Ritchie, who built the efficient bridge between hardware and thought, microprocessors would have entered consumer products such as PCs much later and slower. Therefore this man was essential to modern technology revolution. Can you imagine drivers written in Fortran, Lisp or Cobol, the standard languages at the time DR started? Or in assembly language, which was wildly variable with all the processor types around, at the time? The power of C is that it covers all levels from low to high abstraction. Most other programming languages continue to be an improvised occasional side track: Pascal, Ada, Java, Ruby, Python, all to be replaced by yet other hypes, of which the first compiler, interpreter or virtual machine will have been written in, you guessed it, the C language. Can anybody tell me what happened to Lisp, Algol, APL, Mumps, Dylan, Prolog, Smalltalk & derivatives? It does not matter what language you use: in the end programming requires human blood sweat and tears for any realistic system, usually in the corners where the expressivity of the anguage fails. This being true, I will happily shed all that human effort while programming in C and define my own world of abstractions. It's just a terrible, terrible loss. A void that can never be filled no matter what happens. please, dennis rithie was a celebrity for the world, he deserves a better importance and you must to post to him with more relevance in an channel important as the CNN.